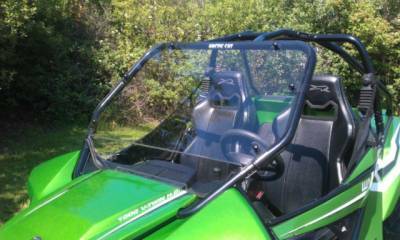 Arctic Cat Wildcat 1000 Sport Full Windshield Fits: 2012-16 Wildcat 1000 WILL NOT FIT: Wildcat Trail (50" Model) 1/4" Thick MR-10 hard coated (both sides) Lexan. (6) Quick Connect Windshield Clamps. DOT-rated and stamped in corner. Velcro strip along the bottom stops rattling. Rubber edge trim along the bottom sides protects and seals your hood. Easily can be removed without any tools. Made in Cleveland, Ohio. Made from 1/4" thick MR-10 hard coated Polycarbonate (Lexan), to ensure you are getting the best material available. It is hard coated on both sides. It attaches with our quick connect windshield clamps so you can easily remove the windshield without any tools. Once you have the clamps installed, simply remove the thumb screws and the windshield is removed. Note: The top two thumbscrews may interfere with some hardtops. If so, you can use 1/4-20 screws instead. Not a big problem just want customers to know.